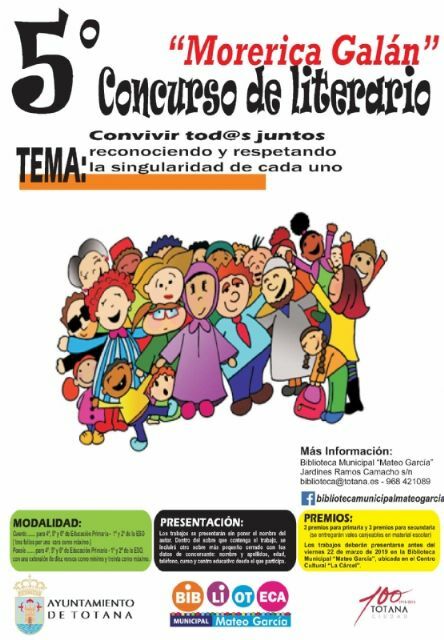 The Department of Culture, through the Municipal Library "Mateo García" and the person involved, recalls that the call for the V Literary Contest "Morerica Galán" is open to primary school students and ESO in the modalities of story and poetry, respectively. The theme of this year's contest is "To live together together recognizing and respecting the uniqueness of each one", and with it we want to advocate for good coexistence and acceptance of all people, regardless of their country of origin , customs, skin color, beliefs, different traditions and own identity to achieve a more humanized and happy society. - Story for 4 Â°, 5 Â° and 6 Â° of Primary Education 1 Â° and 2 Â° of ESO (three pages at the most one-sided). - Poetry for 4th, 5th and 6th grade of Primary Education 1st and 2nd of ESO, with an extension of ten verses (lines) as a minimum and thirty as maximum. and these must be submitted before Friday, March 22, 2019 in the Municipal Library "Mateo García", located in the Sociocultural Center "La Cárcel". and this will assess the absence of spelling mistakes, the correct punctuation, creativity, aesthetics, presentation (images and drawings will not be assessed) and originality of the texts. and the prizes will be bonuses for school materials, which will be handed out during an event on April 30.
and inside the envelope containing the work, another smaller envelope will be included, closed with the contestant's information (name and surnames, age, phone number, course and educational center from which he participates).